Hey everyone! Wow it has been a minute right? Geez. That working life is NO joke. I get up at 6:30, shower, feed the babies breakfast, pack lunches, grab a coffee, drop the baby off at daycare and go to work. What a crazy 5 months it has been. I am currently transitioning to a new job… that is a whole post in itself… but definitely for another time. One thing I realized after going back to work is that… I enjoy socializing with adults! Even though I am quite childish haha… I really enjoyed getting to know my coworkers and catching up on some adult conversation. I missed my kiddos but realized that they are THRIVING in their school/daycares. They get to run and play and socialize and it really just worked out quite wonderfully. 1- Meditate daily. This is so important guys. I really failed with the meditation deal in 2017 and it is 1000% necessary. I put on a few sleep meditations when putting my son to sleep last night, and though it didn’t work for a 4 year old who was very stir crazy from being inside due to snow/below freezing temps for 1 week, it was very relaxing and I noticed it kept him much calmer while going to sleep! 2- Medication. I am seeing my doctor tomorrow and hoping to get on a better medication. I have been so thankful to Prozac for all of its OCD help but I believe there may be another drug out there that can help me out a little more. I tried tapering off for a bit but it was unsuccessful. This does not mean I am a failure. This means that just like any other illness, I have to work at treating it. 3- Cooking. I need to cook more! This past weekend I made a delicious GRAIN FREE, banana/chocolate chip bread and Shepherd’s pie! They were both pretty good! Oh yeah, and I made pork chops! I have had so much anxiety recently and cooking has been a good way to channel that little bit of crazy. 4- Water. I feel like there have been times in my life I was the ultimate spokesperson for water, however, recently I’ve not been as wonderful at hydrating!! I purchased a water bottle from amazon that helps me remember to drink water every hour and I hope to keep it up! Water is so essential! 5- Spend less money. I am a Target, Amazon, Starbucks addict. Last year I wanted to do a post called a “SAT” out… where I boycott Target, Amazon and Starbucks for my own health and wellness lol… but I was too weak! I hope that I can do this soon… however, I equate this to having a food addiction almost. I mean, you can’t stop cold turkey because you still need things like… toilet paper, or medications. It is hard! I have set a limit for starbucks though…and hope I can keep at it. I am dangerously close to it so far though …so …things aren’t looking swell. Its okay! Okay, so there is my small update. I am still around and still very much interested in maintaining this blog! However, things have been SO busy. Maybe meditation will help me with my blog goals! What goals have you set for yourself in 2018? <3. I am addicted to Target. There, I said it. Admitting it is the first step right? hahaha. My first job was at Target, so this has been a long obsession. As for me, I didn’t need any reason to go there more often… but good o’l Target is always looking out for me and they developed a few really good reasons to shop there… for everything. So if you’re a Target regular you may already know about these sweet treats… but if you’re only there every now and then, you may want to take advantage of these offers and visit more often. My first obsession was Cartwheel. Cartwheel is a money saving app at Target. You get a certain number of “free spots” and you can add featured products for the week and save a certain percent off on these items when shopping. You download the app to your phone and the cashier scans it at checkout. Your discount is applied right there. Now, you can even scan the items in your cart before you get to the checkout to see if anything you bought is featured on cartwheel. I love it! If you’re not brand specific in your purchases, it can show you similar items that are on cartwheel if your selected item isn’t featured. I’ve had Cartwheel for a 2 years or so… and have saved over $400! I’ll take it! In the same app as cartwheel, is Red perks. Previously, these were different apps but Target made it convenient by putting them together! Basically red perks is a way to earn points for every dollar spent. 10 points for every dollar. Once you reach 5000 points you can choose from a list of freebies! Let me tell you something about Red Perks. I haven’t bought a package of baby wipes in months. One of the freebies is any brand wipes up to $10. (This used to be 20, so I was bummed when they bumped it down to $10, but hey, you can’t have it all I guess). Anyway, I shop at Target so often that I get to the 5000 pts fairly quickly and always choose wipes!! Other examples of featured freebies are: free pajamas, sunglasses, laundry detergent, movie/cds/books, coffee, pet item, etc. At one point I know that this feature was only available in certain markets. I’m not sure if this is still the case… but if so, come on Target! Give it to everyone! Its awesome! And if you’re listening, my store could really use a Starbucks– and a babysitter. Okay, so …there you go. My tip for today. 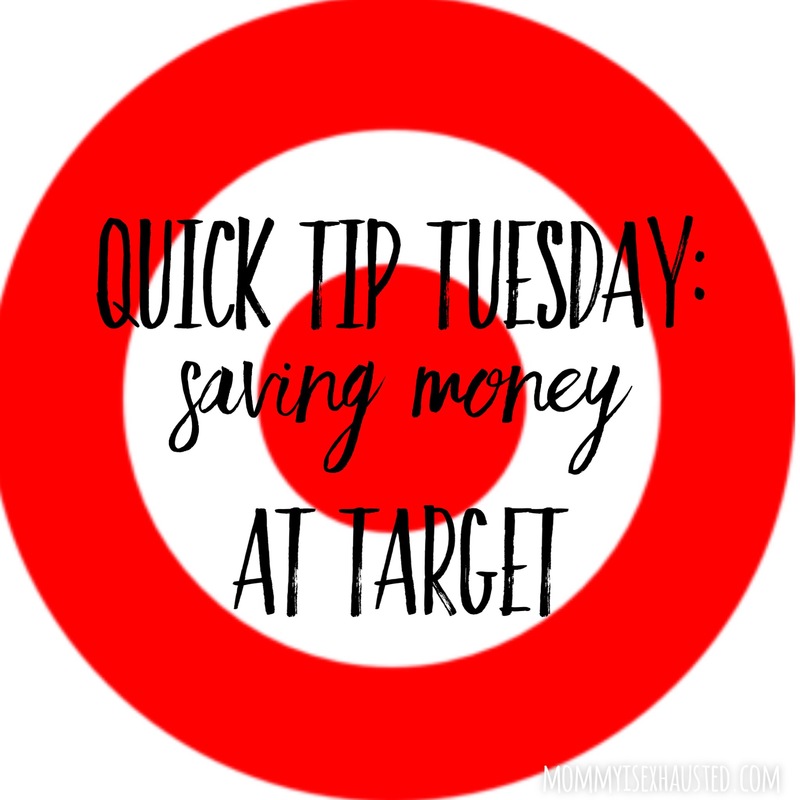 If you’re going to go to Target and spend money anyway, may as well find ways to save! Right? Do you enjoy money saving perks at other stores? Share your favorites in the comments! Quick Tip Tuesday: Skipping the party! So, I’ve been slammed with work. That is why I haven’t been updating. I watch my kids full time and do transcription for a dermatology clinic part time. I stay busy! I wish I could blog whenever I wanted to… but I can’t unfortunately. I love it when I have the time!! Today’s tip is kind of up to you to decide if it works for you or not. Today is my son’s birthday. He is 4! I cannot believe he is 4 years old. I feel like I had him yesterday. I remember them placing him on my chest. I sobbed. I was so happy to meet him. I was so tired. I was so in love. The nurse looked over at me and said “what’s wrong? are you in pain? why are you crying?.” I thought it was very bizarre. This was the single most important moment of my life to that point and this lady was weirded out over my emotion! I’ve thought about this moment so many times in the past 4 years. It represents so much more to me. The nurse, for whatever reason, felt that I wasn’t acting appropriately. Maybe she was concerned something was wrong… but I kind of just wanted the space to feel my feelings. Because of the craziness of the year I chose to do “no party birthdays.” This was a hard decision because it was Claire’s first birthday and Jack is obsessed with birthdays! (really, the kids in his class had to list something they love at valentine’s day- most kids in his class chose their mom or dad… Jack chose birthdays). I made this decision because every year I’ve gone all out and thrown Jack full on Pinterest parties. We’ve had tons of people… too many gifts, big cakes, etc. At the end of the day we’re ALL exhausted, our bank account is a bit smaller, and Jack has a ton of toys he doesn’t touch for 6 months. Also, I read this article recently and decided that I want to be a family like this. I’ve REALLY realized recently how rapidly my children are growing up. It is happening so quickly. I want to experience things with them. I want to connect and enjoy them. I won’t care about a billion cutesy pinterest inspired pictures in the future, I’ll care about having an amazing birthday experience with my 4 year old! As long as he is happy, I’m happy. I’m glad we will have a birthday where we don’t have to worry about details and can focus on the joy his birthday brings! He has made a few requests this birthday. He wants to go to “target, the movies, food lion, lowes, and the mountains.” LOL. I can make some of those happen. 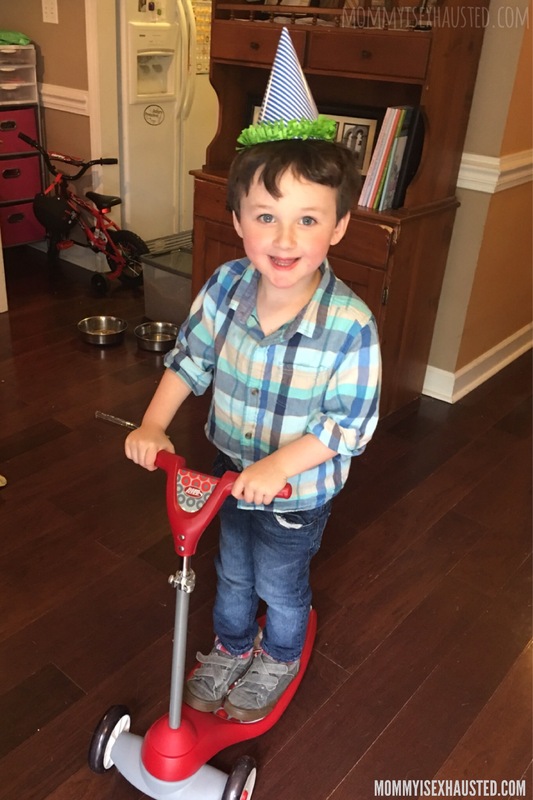 I took him to Target and he got birthday hats and a scooter. 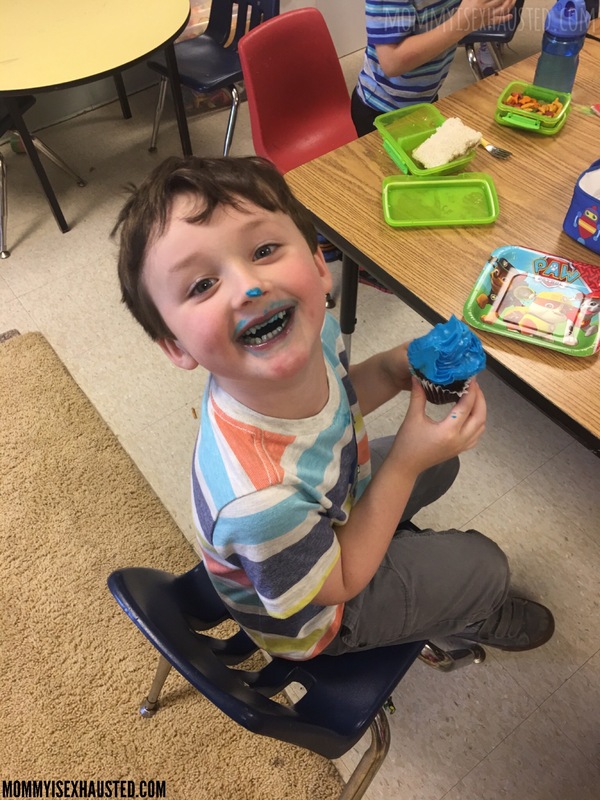 He had cupcakes with his friends at school. We’re going to jump at a trampoline park this weekend and eating dinner at his favorite restaurant tonight. We’re going to the beach next month. (what we also did with his sister for her first birthday! she saw the beach for the 1st time on her 1st birthday!) He is excited and I am getting the opportunity to share that enjoyment with him– rather than worry about small details.